Another cold day greeted a Seahawks playoff game, but they were warmed by the presence of RB Marshawn Lynch, ready for his first game action since Nov. 15. CHARLOTTE — He made the bus. He made the plane. He made it to Bank of America Stadium. 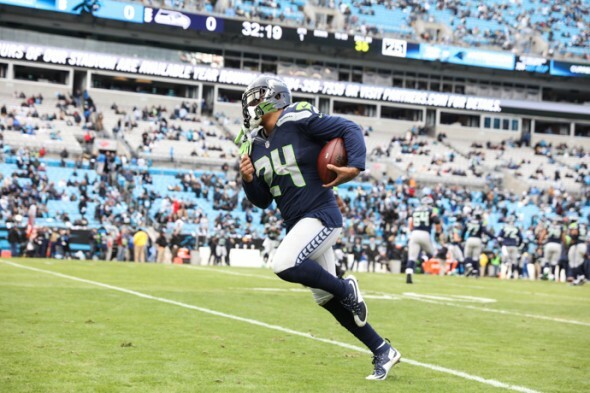 RB Marshawn Lynch was present for the Seahawks NFC divisional game with Carolina Sunday. A few snowflakes arrived too, in the early morning. A winter weather advisory was in effect until 8 a.m. ET., but was nowhere near the subzero temperatures in Minneapolis the past week. For Charlotte, it was definitely chilly — high 30s with a steady breeze. By game time, rain clouds gave way to occasional sunbreaks. Lynch was seeing his first game action since Nov. 15 after hernia surgery Nov. 25. Seahawks inactives included no surprises: CB Tye Smith, RB Bryce Brown, FB Will Tukuafu, LB Eric Pinkins, OG Mark Glowinski, C/G Kristjan Sokoli, DT A.J. Francis. Good to see the over rated, over hyped Seahawks came to play today….. 31-0 already in the second stinking quarter, this game is already over. So this is how these guys come out & play for their fans? What an awful effort & a pathetic way to end the season. They would have been better off losing a close game last week so they wouldn’t have to take this extreme azz whooping. Let’s call that game the First Half Fiasco. Now move on and fix the O-line.